Stand on the Equator at "Mitad del Mundo"
Spanish Immersion for Teens Student Travel: Teens Love our High School Spanish Immersion Programs! Register TODAY with your initial deposit. Limited space available! 2020 Program registration opens in August 2019! Why travel with Common Ground? We guarantee Spanish growth more that any other program available! Our cutting edge pre-departure course prepares the participant for maximum success on immersion! Common Ground trip leaders have decades of experience and focus completely on the participants safety, Spanish development and cultural experience! High school students gain confidence in speaking Spanish, acquire independence, and an awareness of the global possibilities for Spanish in their futures. Safety, Fun, and Learning are combined – We have a LONG track record of offering the best, personalized Spanish Immersion Programs since 2003. Our High School Spanish Immersion trips in Costa Rica are specifically designed to improve your Spanish skills, help you gain cultural understanding, earn at least 15 service learning hours, and experience the beauty of Costa Rica. The four major components of this student travel experience are: Spanish classes, lodging with host families, community service, and adventure travel. Learn more about each of these components by clicking on the pictures below. 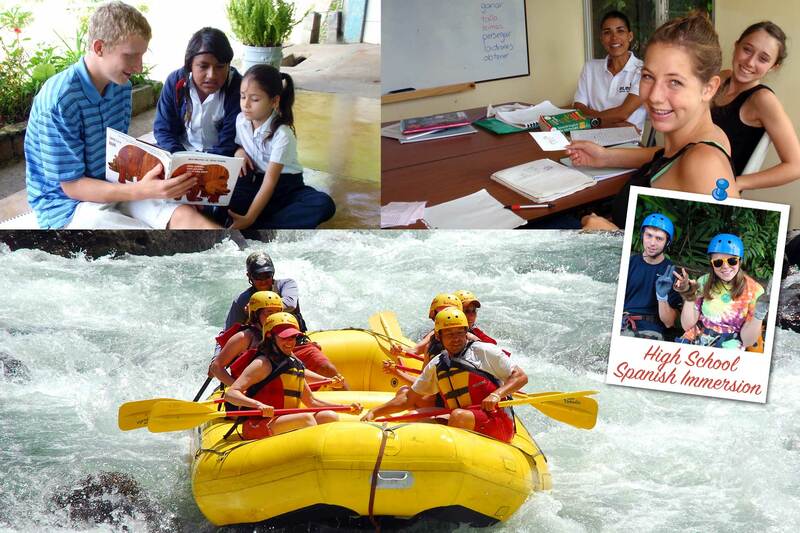 This program is the perfect blend of Spanish Immersion and Adventure. It combines Spanish classes, volunteer work, host family living, and visiting the hot spots in Costa Rica (beaches, volcanos, hiking, ziplining, waterfalls, toucans, sloths, etc.). Host Family Lodging – Spanish Only: Host families keep you speaking Spanish 24/7 during your Spanish immersion program and help you learn cultural insights that you would never pick up if you stayed in a hotel. Community Service – In Spanish: Spanish and humanitarian work mix to create the ultimate learning opportunity, not just about Spanish but about life! This is a fantastic way for you to lend a hand to those in need while speaking Spanish to meet real objectives. You may find service learning projects on other student travel programs, but rarely are they “language-rich” – meaning you have to accomplish real objectives in Spanish to complete the project. Spanish Classes – Taught by Native Spanish Speakers: Spanish classes help you sort out all the fast-paced language you hear day to day while on immersion. It’s difficult to make sense of everything as it comes; we integrate classes into your Spanish immersion program so that you can maximize all the day-to-day learning you’re doing. Since most other student travel programs don’t have a language immersion focus, there’s no need for class! Adventure Travel – In Spanish: Costa Rica is possibly one of the most exciting (and safe) places to travel in Central America. Every Spanish immersion trip to Costa Rica should include some experiences at the beach, visiting volcanoes, and trekking through the rain forest. This is usually the strength of other student travel programs – but we of course integrate Spanish language into our adventures. This program is for teens that love the outdoors, want a physical challenge, have a passion for science, and want to improve their Spanish. This is the ultimate adventure that combines Spanish Immersion AND an Amazon backpacking adventure with local scientists and mountaineers. Spanish Classes & Cultural Immersion –> Spanish classes, cultural activities, host family living. Amazon & Science Backpacking Adventure –> Guided, professional trip in the Amazon with local geologist and biologist in Spanish. To gain some independence and maturity by experiencing life through another cultural perspective. Cultural activities: cooking, dancing classes, etc. Must be in good physical shape to be able to hike and carry backpack!!! Ecuador Itinerary: ¡Program Opens in 2020! 4:00 – 5:30 pm dancing class, cooking class, etc. Day 4 Travel to Immersion Homebase / Meet your host family!!! Days 16 – 21 Spanish & Cultural Immersion Week –> Spanish classes, volunteer work, host family living. Days 23-27 Bean to Bar | Rural Chocolate Farm Experience: Live on a 4th generation organic chocolate farm and learn the art of processing chocolate. Registration first come first served. Limited space available! Our Spanish immersion for teens trips to Costa Rica are more than just educational student travel and Spanish summer camps. We are Spanish teachers and intentionally integrate the four components below into our Spanish immersion programs so that our students can actually say they have Spanish as a practical skill for their futures. Click the links above to learn more about the 4 main components of our High School Spanish immersion programs in Costa Rica. It’s not hard to see how our trips are different than other student travel programs. But, our trip might not be the right travel experience for you (or your teen student). If you’d like a free guide to figuring out the best sort of student travel experience, check this out! Follow us on Facebook to stay in the high school Spanish immersion program loop! How many students do you travel with at a given time? We have a maximum number of around 24 students at any one time on the summer immersion program with us. Who are the chaperones for the High School program? Common Ground has 2-3 staff members who chaperone the high school groups at all times. When our group size nears 20+ students, we typically add a teacher from a school that has students traveling with us to help with the larger numbers. Usually there are more female than male chaperones. We have miles that we’d like to use for our student’s program, is that possible? Absolutely. We can discuss the details about the chaperoned flights and whether or not your miles will put your student on that flight. Do I get credit for the language school classes I attend? Yes and no. Most High Schools are not offering actual high school credit for the time you spend in Costa Rica. However, some schools will allow you to take an exam after you return and potentially test out of a year’s worth of Spanish classes. This is particularly an option for those students on the 4 week summer immersion program. One thing you can certainly apply to your school and club requirements is the amount of time you spend in community service projects. Students are regularly earning between 20 and 60 community service hours for the 2 and 4 week programs respectively. Additionally, if you are an IB student, you may be able to earn up to 75 CAS hours toward your graduation requirements. 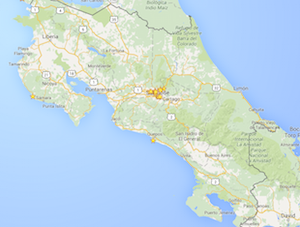 Can my length of stay in Costa Rica be flexible? What if I want to stay and study in Costa Rica for 3 weeks, or more than 4 weeks? Of course your length of stay can be adjusted. We would be happy to work out a custom itinerary with you; just give us a call! (888) 879-2575. What if we’d like to make plans to have a family vacation before or after our student does the Spanish Immersion Program with Common Ground? Not a problem at all. Usually it’s a good idea to plan a family vacation directly after your student finishes their immersion program so that they’re able to show you around a little. We just need to know your plans as you’re submitting your student’s application, and we’ll make sure that appropriate arrangements are made. 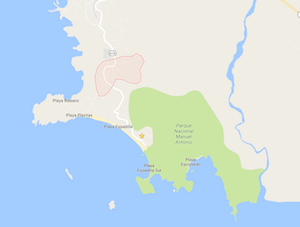 We’re happy to help you with travel suggestions as well if you’d like some ideas about nice places to spend some time with you family in Costa Rica. Do you have any fundraising programs in place to help with the cost of the immersion program? Yes, every year we help students who are interested raising funds for the summer immersion program. We recently launched the Immersion Fund, a 501(c)3 organization that exists to help participants fundraise for trips in a socially conscious way- we like to call it the Purchase with a Purpose movement. Visit our fundraising options page to learn more about selling Case of Hope Jewelry to raise funds for your upcoming trip! Can you come to my school and make a presentation about this program? Of course, we’d be happy to. If you would like to look into scheduling a classroom presentation at your school, just put us in contact with your Spanish teacher or your Foreign/World Languages department head and we’ll see if we can get something on the schedule. Contact us here. find the perfect trip for you!